I just moved to a new computer and ran into this error when trying to run a test. SetUp : System.Exception : ApkFile or InstalledApp has not been configured. 09-10-2017 12:29:41.004 -07:00 - 45 - No named pipe value found in environment variable XTC_IDE. 09-10-2017 12:29:41.004 -07:00 - 46 - Skipped IDE integration, connection failed. 09-10-2017 12:23:16.045 -07:00 - 880 - Attempting IDE connection through pipe d1c8528c29c54462a9371f3ad9678d8e. 09-10-2017 12:23:16.197 -07:00 - 1031 - Deploying app through IDE. 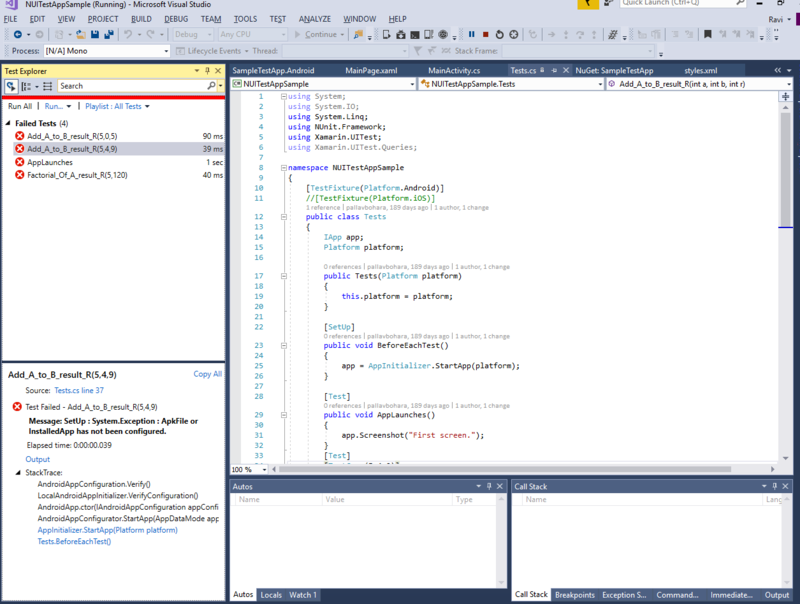 But I did not have to do that on my previous PC, so I would like to try to figure out what is different (both are using Visual Studio 2015). your path to Android SDK is configured ? 09-10-2017 12:29:41.001 -07:00 - 42 - Attempting IDE connection for Android: C:\workspace\MyApp\MyApp.UITests\bin\Release\MyApp.UITests.DLL. 09-10-2017 12:23:16.038 -07:00 - 873 - Attempting IDE connection for Android: C:\workspace\MyApp\MyApp.UITests\bin\Release\MyApp.UITests.DLL. 10-10-2017 09:44:35.941 -07:00 - 51 - Attempting IDE connection through pipe 604c2ffbef9142a68cf041bc719ccaa1. 10-10-2017 09:44:35.968 -07:00 - 77 - Skipped IDE integration, connection failed. So now it looks like it found a pipe to use but it still seems to be failing. As a work around, I ended up just copying my project from my old PC to the new one and that seems to work (previously I had just pulled a copy down from our git repo). I'm still curious as to what the problem was. Can you show your AppInitializer.cs ?